I took a particular approach to my role as discussant, which was based on a thought experiment, in which I imagined myself the editor of the collected papers of the panel. I asked myself, ‘How would I introduce them?’ and, ‘What were their points of analytic agreement and disagreement?’ I had the advantage of being able to do this in front of the author themselves. Now all of this happens – at least in the papers given during the panel – on the basis of textual evidence. This is the place where several things collide: hoary – and sometimes newly-minted – tradition; the historical contexts of authorship, transmission and adaptation; and scholarly and religious categories of analysis. Naomi kicked off the panel with a rich demonstration of the inherent flexibility of the Jātaka form, as it is deployed in the Avadānaśataka. It appeared to me that she tacitly – and tactfully – suggested that the cart may have been placed before the horse in the study of Jātaka and Avadāna. By this I mean that the macro-analytic characterisations of the generic form of Jātaka and Avadāna, as involving either chronology or progression, perfection or devotion, may need to be re-tested against texts like the Avadānaśataka, which are typologically ‘resistant’. Put in another way, the scholarly recipe may not entirely match this particular Buddhist dish. Naomi’s emphasis on the particularities and peculiarities of the text before her suggested the need for groups of tales to be carefully contextualised, both doctrinally and practically, before we may draw distinctions between genres of Buddhist narrative text regardless of what we are told (by ‘insiders’ or ‘outsiders’). Naomi’s paper left us with a distinct scholarly task: to progressively integrate narratives with inferentially recovered communities of reception. In the case of the Avadānaśataka, the communities so recovered were certainly not distinguishing between Jātaka and Avadāna in a hard and fast fashion. Timothy Lenz – with the greatest of scholarly respect – was the fly in the ointment of the panel. His Gandhāran Avadānist was a level-headed and practical fellow, not much taken up with matters doctrinal. Tucked under his arm (forgive my exclusive language, it is for rhetorical purposes only) – and going under the rubric of Avadāna (and rubric is a rather appropriate term in that it means not just a heading, category or class, but also a custom or guideline) – is a collectania, a homiletic aide–mémoire, which is intimately connected to the day to day demands of the religious professional, who is active in the public sphere. He has no time for the sprawling cosmographical vistas of the Avadānaśataka; his goals are exemplification and persuasion. Tim’s vision of Avadāna as collectania is challenging for the theorisation of generic form, if we seek to hang it on doctrinal features of Buddhism, such as karma theory. We cannot rest here, however, as Tim was well aware. To say that an Avadāna, or a Jātaka, is discourse-as-exemplification is to say too much, or not enough: as a definition it captures also the Hitopadeśa, for example, which surely shows that it will not entirely do (or might do, but only in the context of a larger enquiry). Yet we are in a tricky position; Naomi showed that the dominant characterisations of the Jātaka and Avadāna do not adequately capture what is going on in the Avadānaśataka, while Tim showed that Gandhāran context was one in which we could not even be guaranteed that an Avadāna would have anything at all to do with key Buddhist doctrines. What to do? This is, of course, a spectrum rather than a hard and fast opposition. I have little doubt that these capture two rather significant modes of textual transmission and are more or less conducive to the two poles of narrative practice thus far established (of doctrinal or ritual engagement vs. socio-political ‘fit’). Rachel Pang moved us to a consideration of a C19th Tibetan engagement with Jātaka materials, which reflected the ‘summary’ form that Karen identified in her paper. However, it was a summary form that was by no means lacking in the ‘karmic nod’ that Tim so missed in the Gandhāran materials. Rachel questioned the possibility of a formal definition of Jātaka, Avadāna or Jatakāvadāna. This followed from her wish to emphasise the religious concerns of her sources and the limits of western and Sanskrit criticism. She contrasted the simplicity of her source with the kāvyic excesses of Aśvaghoṣa to good effect, for example. What emerged was precisely a demonstration of the fact that we are looking at a spectrum of usage. Her source was a homiletic summary that was, nonetheless, with its heavy dependence on its auto-commentary, scholastically engaged, even if pastorally focussed. The author of her source, Shakbar, is, then, a useful middle term in the ongoing enquiry. Arthid Sharavanichkul explored Jātaka materials in a Thai Theravādin context. The fuzziness in the use of the term Jātaka that he uncovered recalled the blurring of the boundaries between Jātaka and Avadāna that Naomi found in the Avadānaśataka in her paper, notwithstanding the fact that the Thai sources do not know the term Avadāna. 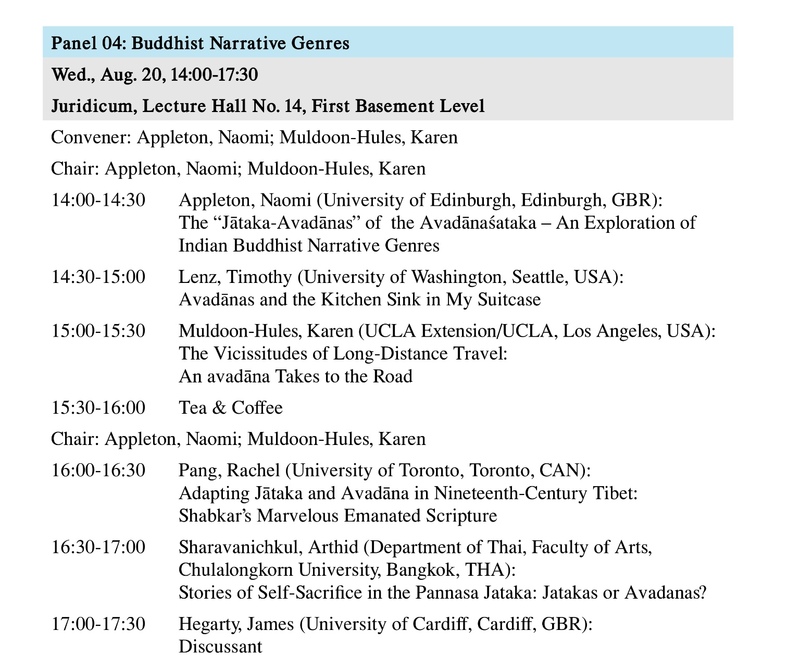 Arthid showed how, in a Thai context, the existing overarching definitions and descriptions of Jātaka and Avadāna, viz. those of Strong and Ohnuma, don’t entirely work (though they are instructive) because the Thai materials demonstrate a blended emphasis on both sacrifice and devotion. Naomi offered us a text that – at least in titular terms – is an Avadāna, but one that is replete with Jātakas. Arthid offered us the opposite. This is a neat demonstration of the fundamental fuzziness of the categories under investigation and the central hypothesis of my – currently – imaginary edited volume. I put a number of questions to the panel in the discussion that followed. I asked them if they had brought us closer to a formal or an extended definition of Jātaka and Avadāna. I also asked them if they thought that they had, in fact, shown us that either sort of definition is an impossibility. I also asked more general questions such as, ‘Is fuzziness always fuzzy?’ by which I referred to the way in which any given instantiation of a genre might choose to subvert or adapt the conventions of that genre and thus depart from it while also confirming the existence of parameters of composition. Put in another way, I asked, ‘When is generic confusion, in fact, artistry/innovation?’ I also asked if scholarly fuzziness was defensible. I suggested that scholars of religion might (as J.Z. Smith concluded in his Reimagining Religion) simply change the way in which they go about defining some of the things they set out to explore, such as by means of extended or polythetic definitions. Other questions were more context-specific: for example, I asked if there was a Brahminical or a Jain elephant in the room. By which I referred to the difficulty of exploring issues of literary and expressive culture on the basis of distinct religions when they share a common cultural context (not true, of course, as Buddhist traditions moved beyond South Asia, but here the question would just concern other – for example, Chinese and Tibetan – elephants in the room). The answers to these questions broadly suggested that comparative studies would be desirable, that definitions were probably superfluous – though not all had given up hope – and that I asked too many questions! I would like to offer my sincere thanks and congratulations to the panel convenors (Naomi and Karen) and contributors for a supremely stimulating afternoon. I would also like to think Steven Collins, who offered a range of insights as our discussions progressed. In thinking about the goals of the present project, the panel contributed much in terms of thinking through the range of uses of religious narrative both within and beyond our period of enquiry and also the real need – at least in an early Indian context – to move across the boundaries that exist between Hindu, Buddhist and Jain studies. This entry was posted in Uncategorized on December 19, 2014 by hegartyjm.